For other uses, see Shinto (disambiguation). Shinto (神道, Shintō) or kami-no-michi (as well as other names)[note 1] is the traditional religion of Japan that focuses on ritual practices to be carried out diligently to establish a connection between present-day Japan and its ancient past. The word Shinto (Way of the Gods) was adopted, originally as Jindō or Shindō, from the written Chinese Shendao (神道, pinyin: shéndào),[note 2] combining two kanji: shin (神), meaning "spirit" or kami; and michi (道), "path", meaning a philosophical path or study (from the Chinese word dào). The oldest recorded usage of the word Shindo is from the second half of the 6th century. Kami is rendered in English as "spirits", "essences", or "gods", and refers to the energy generating the phenomena. Since the Japanese language does not distinguish between singular and plural, kami also refers to the singular divinity, or sacred essence, that manifests in multiple forms: rocks, trees, rivers, animals, objects, places, and people can be said to possess the nature of kami. Kami and people are not separate; they exist within the same world and share its interrelated complexity. As much as nearly 80% of the population in Japan participates in Shinto practices or rituals, but only a small percentage of these identify themselves as "Shintoists" in surveys. This is because Shinto has different meanings in Japan. Most of the Japanese attend Shinto shrines and beseech kami without belonging to an institutional Shinto religion. There are no formal rituals to become a practitioner of "folk Shinto". Thus, "Shinto membership" is often estimated counting only those who do join organised Shinto sects. Shinto has about 81,000 shrines and about 85,000 priests in the country. According to surveys carried out in 2006 and 2008, less than 40% of the population of Japan identifies with an organised religion: around 35% are Buddhists, 3% to 4% are members of Shinto sects and derived religions. In 2008, 26% of the participants reported often visiting Shinto shrines, while only 16.2% expressed belief in the existence of a god or gods (神) in general. According to Inoue (2003): "In modern scholarship, the term is often used with reference to kami worship and related theologies, rituals and practices. In these contexts, 'Shinto' takes on the meaning of 'Japan's traditional religion', as opposed to foreign religions such as Christianity, Buddhism, Islam and so forth." Shrine Shinto (神社神道, Jinja-Shintō), the main tradition of Shinto, has always been a part of Japan's history. It consists of taking part in worship practices and events at local shrines. Before the Meiji Restoration, shrines were disorganized institutions usually attached to Buddhist temples; in the Meiji Restoration, they were made independent systematized institutions. The current successor to the imperial organization system, the Association of Shinto Shrines, oversees about 80,000 shrines nationwide. Imperial Household Shinto (皇室神道, Kōshitsu-Shintō) are the religious rites performed exclusively by the imperial family at the three shrines on the imperial grounds, including the Ancestral Spirits Sanctuary (Kōrei-den) and the Sanctuary of the Kami (Shin-den). Folk Shinto (民俗神道, Minzoku-Shintō) includes the numerous folk beliefs in deities and spirits. Practices include divination, spirit possession, and shamanic healing. Some of their practices come from Buddhism, Taoism or Confucianism, but most come from ancient local traditions. Sect Shinto (教派神道, Kyōha-Shintō) is a legal designation originally created in the 1890s to separate government-owned shrines from local organised religious communities. These communities originated especially in the Edo period. The basic difference between Shrine Shinto and Sect Shinto is that sects are a later development and grew self-consciously. They can identify a founder, a formal set of teachings and even sacred scriptures. Sect Shinto groups are thirteen, and usually classified under five headings: pure Shinto sects (Shinto Taikyo, Shinrikyo and Izumo Oyashirokyo), Confucian sects (Shinto Shusei-ha and Taiseikyo/体制教 ),mountain worship sects (Jikkokyo, Fusokyo and Mitakekyo or Ontakekyo), purification sects (Shinshukyo and Misogikyo), and faith-healing sects (Kurozumikyo／黒住教, Konkokyo/金光教 and its branching Omotokyo/大本教 and Tenrikyo／天理教. Koshintō (古神道, Ko-shintō), literally 'Old Shinto', is a reconstructed "Shinto from before the time of Buddhism", today based on Ainu religion and Ryukyuan practices. It continues the restoration movement begun by Hirata Atsutane. Many other sects and schools can be distinguished. Faction Shinto (宗派神道, Shūha-Shintō) is a grouping of Japanese new religions developed since the second half of the 20th century that have significantly departed from traditional Shinto and are not always regarded as part of it. Kami, shin, or, archaically, jin (神) is defined in English as "god", "spirit", or "spiritual essence", all these terms meaning "the energy generating a thing". Since the Japanese language does not distinguish between singular and plural, kami refers to the divinity, or sacred essence, that manifests in multiple forms. Rocks, trees, rivers, animals, objects, places, and people can be said to possess the nature of kami. Kami and people exist within the same world and share its interrelated complexity. Early anthropologists called Shinto "animistic" in which animate and inanimate things have spirits or souls that are worshipped. The concept of animism in Shinto is no longer current, however. Shinto gods are collectively called yaoyorozu no kami (八百万の神), an expression literally meaning "eight million kami", but interpreted as meaning "myriad", although it can be translated as "many kami". There is a phonetic variation, kamu, and a similar word in the Ainu language, kamui. An analogous word is mi-koto. Kami refers particularly to the power of phenomena that inspire a sense of wonder and awe in the beholder (the sacred), testifying to the divinity of such a phenomenon. It is comparable to what Rudolf Otto described as the mysterium tremendum et fascinans, which translates as "fearful and fascinating mystery". The kami reside in all things, but certain objects and places are designated for the interface of people and kami: yorishiro, shintai, shrines, and kamidana. There are natural places considered to have an unusually sacred spirit about them and are objects of worship. They are frequently mountains, trees, unusual rocks, rivers, waterfalls, and other natural things. In most cases they are on or near a shrine grounds. The shrine is a building in which the kami is enshrined (housed). It is a sacred space, creating a separation from the "ordinary" world. The kamidana is a household shrine that acts as a substitute for a large shrine on a daily basis. In each case the object of worship is considered a sacred space inside which the kami spirit actually dwells, being treated with the utmost respect. In Shinto, kannagara (惟神 or 随神), meaning "way [path] of [expression] of the kami", refers to the law of the natural order. It is the sense of the terms michi or to, "way", in the terms "kami-no-michi" or "Shinto". Those who understand kannagara know the divine, the human, and how people should live. From this knowledge stems the ethical dimension of Shinto, focusing on sincerity (makoto), honesty (tadashii) and purity. According to the Kojiki, Amenominakanushi (天御中主 "All-Father of the Originating Hub", or 天之御中主神 "Heavenly Ancestral God of the Originating Heart of the Universe") is the first kami, and the concept of the source of the universe according to theologies. In mythology, he is described as a "god who came into being alone" (hitorigami), the first of the zōka sanshin("three kami of creation"), and one of the five kotoamatsukami ("distinguished heavenly gods"). Amenominakanushi had been considered a concept developed under the influence of Chinese thought, but now most scholars believe otherwise. With the flourishing of kokugaku the concept was studied by scholars. The theologian Hirata Atsutane identified Amenominakanushi as the spirit of the North Star, master of the seven stars of the Big Dipper. The god was emphasised by the Daikyōin in the Meiji period, and worshiped by some Shinto sects. The god manifests in a duality, a male and a female function, respectively Takamimusubi (高御産巣日神) and Kamimusubi (神産巣日神). In other mythical accounts the originating kami is called Umashiashikabihikoji (宇摩志阿斯訶備比古遅神 "God of the Ashi [Reed]") or Kuninotokotachi (国之常立神 in Kojiki, 国常立尊 in Nihonshoki; Kunitokotachi-no-Kami or Kuninotokotachi-no-Kami; the "God Founder of the Nation"), the latter used in the Nihon Shoki. Izanami-no-Mikoto and Izanagi-no-Mikoto, by Kobayashi Eitaku, late 19th century. The generation of the Japanese archipelago is expressed mythologically as the action of two gods: Izanagi ("He-who-invites") and Izanami ("She-who-is-invited"). The interaction of these two principles begets the islands of Japan and a further group of kami. They lived on this island, and created a palace. Within the palace was a large pole. They had two children (islands) which turned out badly and they cast them out. They decided that the ritual had been done incorrectly the first time. They then gave birth to the eight perfect islands of the Japanese archipelago. After the islands, they gave birth to the other Kami. Izanami-no-Mikoto died in childbirth, however, and Izanagi-no-Mikoto tried to revive her. In the myth, the birth of the god of fire (Kagu-tsuchi) causes the death of Izanami, who descends into Yomi-no-kuni, the netherworld. Izanagi chases her there, but runs away when he finds the dead figure of his spouse. As he returns to the land of the living, Amaterasu (the sun goddess) is born from his left eye, Tsukiyomi (the moon deity) from his right eye, and Susanoo (the storm deity) is born from Izanagi's nose. Shinto purification rite after a ceremonial children's sumo tournament at the Kamigamo Jinja in Kyoto. Shinto teaches that certain deeds create a kind of ritual impurity that one should want cleansed for one's own peace of mind and good fortune rather than because impurity is wrong. Wrong deeds are called "impurity" (穢れ, kegare), which is opposed to "purity" (清め, kiyome). Normal days are called "day" (ke), and festive days are called "sunny" or, simply, "good" (hare). Those who are killed without being shown gratitude for their sacrifice will hold a grudge (怨み, urami) (grudge) and become powerful and evil kami who seek revenge (aragami). Additionally, if anyone is injured on the grounds of a shrine, the area must be ritually purified. Purification rites called Harae are a vital part of Shinto. They are done on a daily, weekly, seasonal, lunar, and annual basis. These rituals are the lifeblood of the practice of Shinto. [unreliable source?] Such ceremonies have also been adapted to modern life. New buildings made in Japan are frequently blessed by a Shinto priest called kannushi (神主) during the groundbreaking ceremony (Jichinsai 地鎮祭), and many cars made in Japan have been blessed as part of the assembly process. Moreover, many Japanese businesses built outside Japan have a Shinto priest perform ceremonies. On occasion priests visit annually to re-purify. It is common for families to participate in ceremonies for children at a shrine, yet have a Buddhist funeral at the time of death. In old Japanese legends, it is often claimed that the dead go to a place called yomi (黄泉), a gloomy underground realm with a river separating the living from the dead mentioned in the legend of Izanami and Izanagi. This yomi very closely resembles the Greek Hades; however, later myths include notions of resurrection and even Elysium-like descriptions such as in the legend of Okuninushi and Susanoo. Shinto tends to hold negative views on death and corpses as a source of pollution called kegare. However, death is also viewed as a path towards apotheosis in Shinto as can be evidenced by how legendary individuals become enshrined after death. Perhaps the most famous would be Emperor Ōjin, who was enshrined as Hachiman, the God of War, after his death. Unlike many religions, one does not need to publicly profess belief in Shinto to be a believer. Whenever a child is born in Japan, a local Shinto shrine adds the child's name to a list kept at the shrine and declares him or her a "family child" (氏子, ujiko). After death an ujiko becomes a "family spirit", or "family kami" (氏神, ujigami). One may choose to have one's name added to another list when moving and then be listed at both places. Names can be added to the list without consent and regardless of the beliefs of the person added to the list. This is not considered an imposition of belief, but a sign of being welcomed by the local kami, with the promise of addition to the pantheon of kami after death. Shinto funerals were established during the Tokugawa period and focused on two themes: concern for the fate of the corpse and maintenance of the relationship between the living and the dead. There are at least twenty steps involved in burying the dead. Mourners wear solid black in a day of mourning called Kichu-fuda and a Shinto priest will perform various rituals. People will give monetary gifts to the deceased's family called Koden, and Kotsuge is the gathering of the deceased's ashes. Some of the ashes are taken by family members to put in their home shrines at the step known as Bunkotsu. The principal worship of kami is done at public shrines or worship at small home shrines called kamidana (神棚, lit. "god-shelf"). The public shrine is a building or place that functions as a conduit for kami. A fewer number of shrines are also natural places called mori. The most common of the mori are sacred groves of trees, or mountains, or waterfalls. All shrines are open to the public at some times or throughout the year. While many of the public shrines are elaborate structures, all are characteristic Japanese architectural styles of different periods depending on their age. Shrines are fronted by a distinctive Japanese gate (鳥居, torii) made of two uprights and two crossbars denoting the separation between common space and sacred space. The torii have 20 styles and matching buildings based on the enshrined kami and lineage. There are a number of symbolic and real barriers that exist between the normal world and the shrine grounds including: statues of protection, gates, fences, ropes, and other delineations of ordinary to sacred space. Usually there will be only one or sometimes two approaches to the Shrine for the public and all will have the torii over the way. In shrine compounds, there are a haiden (拝殿) or public hall of worship, heiden (幣殿) or hall of offerings and the honden (本殿) or the main hall. The innermost precinct of the grounds is the honden or worship hall, which is entered only by the high priest, or worshippers on certain occasions. The honden houses the symbol of the enshrined kami. The heart of the shrine is periodic rituals, spiritual events in parishioners' lives, and festivals. All of this is organized by priests who are both spiritual conduits and administrators. Shrines are private institutions, and are supported financially by the congregation and visitors. Some shrines may have festivals that attract hundreds of thousands, especially in the New Year season. Yasukuni Shrine (Tokyo), a shrine dedicated to Japan's war dead. Any person may visit a shrine and one need not be Shinto to do this. Doing so is called Omairi. Typically there are a few basic steps to visiting a shrine. At any entrance gate, bow respectfully before passing through. If there is a hand washing basin provided, perform Temizu: take the dipper in your right hand and scoop up water. Pour some onto your left hand, then transfer the dipper to your left hand and pour some onto your right hand. Transfer the dipper to your right hand again, cup your left palm, and pour water into it, from which you will take the water into your mouth (never drink directly from the dipper), silently swish it around in your mouth (do not drink), then quietly spit it out into your cupped left hand (not into the reservoir). Then, holding the handle of the dipper in both hands, turn it vertically so that the remaining water washes over the handle. Then replace it where you found it. Approach the shrine; if there is a bell, you may ring the bell first (or after depositing a donation); if there is a box for donations, leave a modest one in relation to your means; then bow twice, clap twice, and hold the second clap with your hands held together in front of your heart for a closing bow after your prayers. There is variation in how this basic visitation may go, and depending on the time of year and holidays there may also be other rituals attached to visitations. Be sincere and respectful to the staff and other visitors, and if at all possible, be quiet. Do be aware that there are places one should not go on the shrine grounds. Do not wear shoes inside any buildings. The rite of ritual purification, harae or harai, usually done daily at a shrine, is a ceremony of offerings and prayers of several forms. Shinsen (food offerings of fruit, fish, and vegetables), tamagushi (sakaki tree branches), shio (salt), gohan (rice), mochi (rice cake), and sake (rice wine) are all typical offerings. On holidays and other special occasions the inner shrine doors may be opened and special offerings made. Misogi harai, or Misogi Shūhō (禊修法), is the term for water purification. The practice of purification by ritual use of water while reciting prayers is typically done daily by regular practitioners, and when possible by lay practitioners. There is a defined set of prayers and physical activities that precede and occur during the ritual. This will usually be performed at a shrine, in a natural setting, but can be done anywhere there is clean running water. The basic performance of this is the hand and mouth washing (Temizu 手水) done at the entrance to a shrine. The more dedicated believer may perform misogi by standing beneath a waterfall or performing the ritual ablutions in a river. This practice comes from Shinto history, when the kami Izanagi-no-Mikoto first performed misogi after returning from the land of Yomi, where he was made impure by Izanami-no-Mikoto after her death. Another form of ritual cleanliness is avoidance, which means that a taboo is placed upon certain persons or acts. To illustrate, one would not visit a shrine if a close relative in the household had died recently. Killing is generally unclean and is to be avoided. When one is performing acts that harm the land or other living things, prayers and rituals are performed to placate the Kami of the area. This type of cleanliness is usually performed to prevent ill things from happening. Ema are small wooden plaques that wishes or desires are written upon and left at a place in the shrine grounds so that one may get a wish or desire fulfilled. They have a picture on them and are frequently associated with the larger Shrines. Ofuda are talismans—made of paper, wood, or metal—that are issued at shrines. They are inscribed with the names of kami and are used for protection in the home. They are typically placed in the home at a kamidana. Ofuda may be kept anywhere, as long as they are in their protective pouches, but there are several rules about the proper placement of kamidana. They are also renewed annually. Omamori are personal-protection amulets that are sold by shrines. They are frequently used to ward off bad luck and to gain better health. More recently, there are also amulets to promote good driving, good business, and success at school. Their history lies with Buddhist practice of selling amulets. They are generally replaced once a year, and old omamori are brought to a shrine so they can be properly disposed of through burning by a priest. 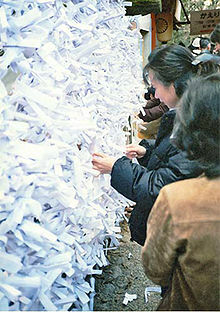 Omikuji are paper lots upon which personal fortunes are written. The fortunes can range from daikichi (大吉), meaning "great good luck," to daikyou (大凶), meaning "great bad luck." A daruma is a round, paper doll of the Indian monk, Bodhidharma. The recipient makes a wish and paints one eye; when the goal is accomplished, the recipient paints the other eye. While this is a Buddhist practice, darumas can be found at shrines, as well. These dolls are very common. Other protective items include dorei, which are earthenware bells that are used to pray for good fortune. These bells are usually in the shapes of the zodiacal animals: hamaya, which are symbolic arrows for the fight against evil and bad luck; and Inuhariko, which are paper dogs that are used to induce and to bless good births. Kagura is the ancient Shinto ritual dance of shamanic origin. The word "kagura" is thought to be a contracted form of kami no kura or "seat of the kami" or the "site where the kami is received." There is a mythological tale of how kagura dance came into existence. The sun goddess Amaterasu became very upset at her brother so she hid in a cave. All of the other gods and goddesses were concerned and wanted her to come outside. Ame-no-uzeme began to dance and create a noisy commotion in order to entice Amaterasu to come out. The kami (gods) tricked Amaterasu by telling her there was a better sun goddess in the heavens. Amaterasu came out and light returned to the universe. Music plays a very important role in the kagura performance. Everything from the setup of the instruments to the most subtle sounds and the arrangement of the music is crucial to encouraging the kami to come down and dance. The songs are used as magical devices to summon the gods and as prayers for blessings. Rhythm patterns of five and seven are common, possibly relating to the Shinto belief of the twelve generations of heavenly and earthly deities. There is also vocal accompaniment called kami uta in which the drummer sings sacred songs to the gods. Often the vocal accompaniment is overshadowed by the drumming and instruments, reinforcing that the vocal aspect of the music is more for incantation rather than aesthetics. In both ancient Japanese collections, the Nihongi and Kojiki, Ame-no-uzeme’s dance is described as asobi, which in old Japanese language means a ceremony that is designed to appease the spirits of the departed, and which was conducted at funeral ceremonies. Therefore, kagura is a rite of tama shizume, of pacifying the spirits of the departed. In the Heian period (8th–12th centuries) this was one of the important rites at the Imperial Court and had found its fixed place in the tama shizume festival in the eleventh month. At this festival people sing as accompaniment to the dance: "Depart! Depart! Be cleansed and go! Be purified and leave!" This rite of purification is also known as chinkon. It was used for securing and strengthening the soul of a dying person. It was closely related to the ritual of tama furi (shaking the spirit), to call back the departed soul of the dead or to energize a weakened spirit. Spirit pacification and rejuvenation were usually achieved by songs and dances, also called asobi. The ritual of chinkon continued to be performed on the emperors of Japan, thought to be descendents of Amaterasu. It is possible that this ritual is connected with the ritual to revive the sun goddess during the low point of the winter solstice. There is a division between the kagura that is performed at the Imperial palace and the shrines related to it, and the kagura that is performed in the countryside. Folk kagura, or kagura from the countryside is divided according to region. The following descriptions relate to sato kagura, kagura that is from the countryside. The main types are: miko kagura, Ise kagura, Izumo kagura, and shishi kagura. A miko (woman consecrated to a Shinto deity) at Inari Shrine. Miko kagura is the oldest type of kagura and is danced by women in Shinto shrines and during folk festivals. The ancient miko were shamanesses, but are now considered priestesses in the service of the Shinto Shrines. Miko kagura originally was a shamanic trance dance, but later, it became an art and was interpreted as a prayer dance. It is performed in many of the larger Shinto shrines and is characterized by slow, elegant, circular movements, by emphasis on the four directions and by the central use of torimono (objects dancers carry in their hands), especially the fan and bells. Ise kagura is a collective name for rituals that are based upon the yudate (boiling water rites of Shugendō origin) ritual. It includes miko dances as well as dancing of the torimono type. The kami are believed to be present in the pot of boiling water, so the dancers dip their torimono in the water and sprinkle it in the four directions and on the observers for purification and blessing. Izumo kagura is centered in the Sada shrine of Izumo, Shimane prefecture. It has two types: torimono ma, unmasked dances that include held objects, and shinno (sacred No), dramatic masked dances based on myths. Izumo kagura appears to be the most popular type of kagura. Shishi kagura also known as the Shugen-No tradition, uses the dance of a shishi (lion or mountain animal) mask as the image and presence of the deity. It includes the Ise daikagura group and the yamabushi kagura and bangaku groups of the Tohoku area (Northeastern Japan). Ise daikagura employs a large red Chinese type of lion head which can move its ears. The lion head of the yamabushi kagura schools is black and can click its teeth. Unlike other kagura types in which the kami appear only temporarily, during the shishi kagura the kami is constantly present in the shishi head mask. During the Edo period, the lion dances became showy and acrobatic losing its touch with spirituality. However, the yamabushi kagura tradition has retained its ritualistic and religious nature. Originally, the practice of kagura involved authentic possession by the kami invoked. In modern-day Japan it appears to be difficult to find authentic ritual possession, called kamigakari, in kagura dance. However, it is common to see choreographed possession in the dances. Actual possession is not taking place but elements of possession such as losing control and high jumps are applied in the dance. The Kojiki (Record of Ancient Matters). The oldest book of Japanese history, it describes the origin myths of Japan and the Imperial Family beginning from 628. The Nihon Shoki (Chronicles of Japan), and its Shoku Nihongi (Continuing Chronicles of Japan), describes events up to 697. Some of the stories in the Nihongi are more detailed, but contradictory, to the stories of the Kojiki. The Rikkokushi (Six National Histories) includes the Nihon Shoki and Shoku Nihongi. The Engishiki contains a section describing Shinto rituals in thorough detail. The Jinnō Shōtōki (a study of Shinto and Japanese politics and history), written in the 14th century. Shinto has very ancient roots in the Japanese islands. The recorded history dates to the Kojiki (712) and Nihon Shoki (720), but archeological records date back significantly further. Both are compilations of prior oral traditions. The Kojiki establishes the Japanese imperial family as the foundation of Japanese culture, being the descendants of Amaterasu Omikami. There is also a creation myth and a genealogy of the gods. The Nihon Shoki was more interested in creating a structural system of government, foreign policy, religious hierarchy, and domestic social order. There is an internal system of historical Shinto development that configures the relationships between Shinto and other religious practices over its long history; the inside and outside Kami (spirits). The inside Kami, or ujigami (uji meaning clan), roles that supports cohesion and continuation of established roles and patterns; and the hitogami or outside Kami, bringing innovation, new beliefs, new messages, and some instability. Jōmon peoples of Japan used natural housing, predated rice farming, and frequently were hunter-gatherers; the physical evidence for ritual practices are difficult to document. There are many locations of stone ritual structures, refined burial practices and early Torii that lend to the continuity of primal Shinto. The Jōmon had a clan-based tribal system developed similar to much of the world's indigenous people. In the context of this clan based system, local beliefs developed naturally and when assimilation between clans occurred, they also took on some beliefs of the neighboring tribes. At some point there was a recognition that the ancestors created the current generations and the reverence of ancestors (tama) took shape. There was some trade amongst the indigenous peoples within Japanese islands and the mainland, as well as some varying migrations. The trade and interchange of people helped the growth and complexity of the peoples spirituality by exposure to new beliefs. The natural spirituality of the people appeared to be based on the worship of nature forces or mono, and the natural elements to which they all depended. The gradual introduction of methodical religious and government organizations from mainland Asia starting around 300 BCE seeded the reactive changes in primal Shinto over the next 700 years to a more formalized system. These changes were directed internally by the various clans frequently as a syncratic cultural event to outside influences. Eventually as the Yamato gained power a formalization process began. The genesis of the Imperial household and subsequent creation of the Kojiki helped facilitate the continuity needed for this long term development through modern history. There is today a balance between outside influences of Buddhist, Confucian, Taoist, Abrahamic, Hindu and secular beliefs. In more modern times Shinto has developed new branches and forms on a regular basis, including leaving Japan. By the end of the Jōmon period, a dramatic shift had taken place according to archaeological studies. New arrivals from the continent seem to have invaded Japan from the West, bringing with them new technologies such as rice farming and metallurgy. The settlements of the new arrivals seem to have coexisted with those of the Jōmon for some time. Under these influences, the incipient cultivation of the Jōmon evolved into sophisticated rice-paddy farming and government control. Many other elements of Japanese culture also may date from this period and reflect a mingled migration from the northern Asian continent and the southern Pacific areas. Among these elements are Shinto mythology, marriage customs, architectural styles, and technological developments such as lacquerware, textiles, laminated bows, metalworking, and glass making. The Jōmon is succeeded by the Yayoi period. Japanese culture begins to develop in no small part due to influences from mainland trade and immigration from China. During this time in the pre-writing historical period, objects from the mainland start appearing in large amounts, specifically mirrors, swords, and jewels. All three of these have a direct connection to the imperial divine status as they are the symbols of imperial divinity and are Shinto honorary objects. Also the rice culture begins to blossom throughout Japan and this leads to the settlement of society, and seasonal reliance of crops. Both of these changes are highly influential on the Japanese people's relationship to the natural world, and likely development of a more complex system of religion. This is also the period that is referenced as the beginning of the divine imperial family. The Yayoi culture was a clan based culture that lived in compounds with a defined leader who was the chief and head priest. They were responsible for the relationship with their "gods" Kami and if one clan conquered another, their "god" would be assimilated. The earliest records of Japanese culture were written by Chinese traders who described this land as "Wa". This time period led to the creation of the Yamato culture and development of formal Shinto practices. The development of niiname or the (now) Shinto harvest festival is attributed to this period as offerings for good harvests of similar format (typically rice) become common. The great bells and drums, Kofun burial mounds, and the founding of the imperial family are important to this period. This is the period of the development of the feudal state, and the Yamato and Izumo cultures. Both of these dominant cultures have a large and central shrine which still exists today, Ise Shrine in the North East and Izumo Taisha in the South West. This time period is defined by the increase of central power in Naniwa, now Osaka, of the feudal lord system. Also there was an increasing influence of Chinese culture which profoundly changed the practices of government structure, social structure, burial practices, and warfare. The Japanese also held close alliance and trade with the Gaya confederacy which was in the south of the peninsula. The Paekche in the Three Kingdoms of Korea had political alliances with Yamato, and in the 5th century imported the Chinese writing system to record Japanese names and events for trade and political records. In 513 they sent a Confucian scholar to the court to assist in the teachings of Confucian thought. In 552 or 538 a Buddha image was given to the Yamato leader which profoundly changed the course of Japanese religious history, especially in relation to the undeveloped native religious conglomeration that was Shinto. In the latter 6th century, there was a breakdown of the alliances between Japan and Paekche but the influence led to the codification of Shinto as the native religion in opposition to the extreme outside influences of the mainland. Up to this time Shinto had been largely a clan ('uji') based religious practice, exclusive to each clan. The Theory of Five Elements in Yin and Yang philosophy of Taoism and the esoteric Buddhism had a profound impact on the development of a unified system of Shinto beliefs. In the early Nara period, the Kojiki and the Nihon Shoki were written by compiling existing myths and legends into a unified account of Japanese mythology. These accounts were written with two purposes in mind: the introduction of Taoist, Confucian, and Buddhist themes into Japanese religion; and garnering support for the legitimacy of the Imperial house, based on its lineage from the sun goddess, Amaterasu. Much of modern Japan was under only fragmentary control by the Imperial family, and rival ethnic groups. The mythological anthologies, along with other poetry anthologies like the Collection of Ten Thousand Leaves (Man'yōshū) and others, were intended to impress others with the worthiness of the Imperial family and their divine mandate to rule. In particular the Asuka rulers of 552–645 saw disputes between the more major families of the clan Shinto families. There were disputes about who would ascend to power and support the imperial family between the Soga and Mononobe/Nakatomi Shinto families. The Soga family eventually prevailed and supported Empress Suiko and Prince Shōtoku, who helped impress Buddhist faith into Japan. However, it was not until the Hakuho ruling period of 645–710 that Shinto was installed as the imperial faith along with the Fujiwara Clan and reforms that followed. Beginning with Emperor Tenmu (672–686), continuing through Empress Jitō (686–697) and Emperor Monmu (697–707) Court Shinto rites are strengthened and made parallel to Buddhist beliefs in court life. Prior to this time clan Shinto had dominated and a codification of "Imperial Shinto" did not exist as such. The Nakatomi family are made the chief court Shinto chaplains and chief priests at Ise Daijingū which held until 1892. Also the practice of sending imperial princesses to the Ise shrine begins. This marks the rise of Ise Daijingū as the main imperial shrine historically. Due to increasing influence from Buddhism and mainland Asian thought, codification of the "Japanese" way of religion and laws begins in earnest. This culminates in three major outcomes: Taihō Code (701 but started earlier), the Kojiki (712), and the Nihon Shoki (720). The Taiho Code also called Ritsuryō (律令) was an attempt to create a bulwark to dynamic external influences and stabilize the society through imperial power. It was a liturgy of rules and codifications, primarily focused on regulation of religion, government structure, land codes, criminal and civil law. All priests, monks, and nuns were required to be registered, as were temples. The Shinto rites of the imperial line were codified, especially seasonal cycles, lunar calendar rituals, harvest festivals, and purification rites. The creation of the imperial Jingi-kan or Shinto Shrine office was completed. This period hosted many changes to the country, government, and religion. The capital is moved again to Heijō-kyō, or Nara, in AD 710 by Empress Genmei due to the death of the Emperor. This practice was necessary due to the Shinto belief in the impurity of death and the need to avoid this pollution. However, this practice of moving the capital due to "death impurity" is then abolished by the Taihō Code and rise in Buddhist influence. The establishment of the imperial city in partnership with Taihō Code is important to Shinto as the office of the Shinto rites becomes more powerful in assimilating local clan shrines into the imperial fold. New shrines are built and assimilated each time the city is moved. All of the grand shrines are regulated under Taihō and are required to account for incomes, priests, and practices due to their national contributions. During this time, Buddhism becomes structurally established within Japan by Emperor Shōmu (r. 724–749), and several large building projects are undertaken. The Emperor lays out plans for the Buddha Dainichi (Great Sun Buddha), at Tōdai-ji assisted by the Priest Gyogi (or Gyoki) Bosatsu. The priest Gyogi went to Ise Daijingu Shrine for blessings to build the Buddha Dainichi. They identified the statue of Viarocana with Amaterasu (the sun goddess) as the manifestation of the supreme expression of universality. The priest Gyogi is known for his belief in assimilation of Shinto Kami and Buddhas. Shinto kami are commonly being seen by Buddhist clergy as guardians of manifestation, guardians, or pupils of Buddhas and bodhisattvas. The priest Gyogi conferred boddhisattva precepts on the Emperor in 749 effectively making the Imperial line the head of state and divine to Shinto while beholden to Buddhism. With the introduction of Buddhism and its rapid adoption by the court in the 6th century, it was necessary to explain the apparent differences between native Japanese beliefs and Buddhist teachings. One Buddhist explanation saw the kami as supernatural beings still caught in the cycle of birth and rebirth (reincarnation). The kami are born, live, die, and are reborn like all other beings in the karmic cycle. However, the kami played a special role in protecting Buddhism and allowing its teachings of compassion to flourish. This explanation was later challenged by Kūkai (空海, 774–835), who saw the kami as different embodiments of the Buddhas themselves (honji suijaku theory). For example, he linked Amaterasu (the sun goddess and ancestor of the Imperial family) with Dainichi Nyorai, a central manifestation of the Buddhists, whose name means literally "Great Sun Buddha". In his view, the kami were just Buddhas by another name. Buddhism and Shinto coexisted and were amalgamated in the shinbutsu shūgō and Kūkai's syncretic view held wide sway up until the end of the Edo period. There was no theological study that could be called "Shinto" during medieval and early modern Japanese history, and a mixture of Buddhist and popular beliefs proliferated. At that time, there was a renewed interest in "Japanese studies" (kokugaku), perhaps as a result of the closed country policy. In the 18th century, various Japanese scholars, in particular Motoori Norinaga (本居 宣長, 1730–1801), tried to tear apart the "real" Shinto from various foreign influences. The attempt was largely unsuccessful, since as early as the Nihon Shoki parts of the mythology were explicitly borrowed from Taoism doctrines. For example, the co-creator deities Izanami and Izanagi are explicitly compared to yin and yang. However, the attempt did set the stage for the arrival of state Shinto, following the Meiji Restoration (c. 1868), when Shinto and Buddhism were separated (shinbutsu bunri). Fridell argues that scholars call the period 1868–1945 the "State Shinto period" because, "during these decades, Shinto elements came under a great deal of overt state influence and control as the Japanese government systematically utilized shrine worship as a major force for mobilizing imperial loyalties on behalf of modern nation-building." However, the government had already been treating shrines as an extension of government before Meiji; see for example the Tenpō Reforms. Moreover, according to the scholar Jason Ānanda Josephson, It is inaccurate to describe shrines as constituting a "state religion" or a "theocracy" during this period since they had neither organization, nor doctrine, and were uninterested in conversion. The Meiji Restoration reasserted the importance of the emperor and the ancient chronicles to establish the Empire of Japan, and in 1868 the government attempted to recreate the ancient imperial Shinto by separating shrines from the temples that housed them. During this period, numerous scholars of kokugaku believed that this national Shinto could be the unifying agent of the country around the Emperor while the process of modernization was undertaken with all possible speed. The psychological shock of the Western "Black Ships" and the subsequent collapse of the shogunate convinced many that the nation needed to unify in order to resist being colonized by outside forces. In 1871, a Ministry of Rites (jingi-kan) was formed and Shinto shrines were divided into twelve levels with the Ise Shrine (dedicated to Amaterasu, and thus symbolic of the legitimacy of the Imperial family) at the peak and small sanctuaries of humble towns at the base. The following year, the ministry was replaced with a new Ministry of Religion, charged with leading instruction in "shushin" (moral courses). Priests were officially nominated and organized by the state, and they instructed the youth in a form of Shinto theology based on the official dogma of the divinity of Japan's national origins and its Emperor. However, this propaganda did not take, and the unpopular Ministry of Rites was dissolved in the mid-1870s. Although the government sponsorship of shrines declined, Japanese nationalism remained closely linked to the legends of foundation and emperors, as developed by the kokugaku scholars. In 1890, the Imperial Rescript on Education was issued, and students were required to ritually recite its oath to "offer yourselves courageously to the State" as well as to protect the Imperial family. Such processes continued to deepen throughout the early Shōwa period, coming to an abrupt end in August 1945 when Japan lost the war in the Pacific. On 1 January 1946, Emperor Shōwa issued the Ningen-sengen, in which he quoted the Five Charter Oath of Emperor Meiji and declared that he was not an akitsumikami (a deity in human form). The imperial era came to an abrupt close with the end of World War II, when Americans declared that Japanese nationalism had been informed by something called "State Shinto", which they attempted to define with the Shinto Directive. The meaning of "State Shinto" has been a matter of debate ever since. In the post-war period, numerous "New Religions" cropped up, many of them ostensibly based on Shinto, but on the whole, Japanese religiosity may have decreased. However, the concept of religion in Japan is a complex one. A survey conducted in the mid-1970s indicated that of those participants who claimed not to believe in religion, one-third had a Buddhist or Shinto altar in their home, and about one quarter carried an omamori (an amulet to gain protection by kami) on their person. Following the war, Shinto shrines tended to focus on helping ordinary people gain better fortunes for themselves through maintaining good relations with their ancestors and other kami. The number of Japanese citizens identifying their religious beliefs as Shinto has declined a great deal, yet the general practice of Shinto rituals has not decreased in proportion, and many practices have persisted as general cultural beliefs (such as ancestor worship), and community festivals (matsuri)—focusing more on religious practices. The explanation generally given for this anomaly is that, following the demise of State Shinto, modern Shinto has reverted to its more traditional position as a traditional religion which is culturally ingrained, rather than enforced. In any case, Shinto and its values continue to be a fundamental component of the Japanese cultural mindset. Shinto has also spread abroad to a limited extent, and a few non-Japanese Shinto priests have been ordained. A relatively small number of people practice Shinto in America. There are several Shinto shrines in America. Shrines were also established in Taiwan and Korea during the period of Japanese imperial rule, but following the war, they were either destroyed or converted into some other use. Within Shinto, there are a variety of sects which are not a part of Shrine Shinto and the officially defunct State Shinto. Sect Shinto, like Izumo Taishakyo Mission of Hawaii and Konkokyo, have unique practices which originated alongside older Shinto practices before the classification and separation of Shinto practices of the Meiji era in 1868. ^ Both mean the "way of the divine" or "of the gods". ^ Stuart D.B. Picken, 1994. p. xxiv. ^ John Nelson. A Year in the Life of a Shinto Shrine. 1996. pp. 7–8. ^ a b c d e f g h i j k l m n o p q Richard Pilgrim, Robert Ellwood (1985). Japanese Religion (1st ed.). Englewood Cliffs, NJ: Prentice Hall Inc. pp. 18–19. ISBN 978-0-13-509282-8. ^ Mark Teeuwen. From Jindō to Shintō. A Concept Takes Shape. Japanese Journal of Religious Studies, 2002, 29/3–4. ^ a b c d e f Sokyo, Ono (1962). Shinto: The Kami Way (1st ed.). Rutland, VT: Charles E Tuttle Co. p. 2. ISBN 978-0-8048-1960-2. OCLC 40672426. ^ a b "宗教団体数，教師数及び信者数". Statistical Yearbook of Japan. Statistics Japan, Ministry of Internal Affairs and Communications. 2015. Retrieved August 25, 2015. ^ Dentsu Communication Institute, Japan Research Center: Sixty Countries' Values Databook (世界60カ国価値観データブック). ^ a b "2008 NHK survey of religion in Japan — 宗教的なもの にひかれる日本人〜ISSP国際比較調査（宗教）から〜" (PDF). NHK Culture Research Institute. ^ Sokyo, Ono (1962). Shinto: The Kami Way (1st ed.). Rutland, VT: Charles E Tuttle Co. p. 13. ISBN 978-0-8048-1960-2. OCLC 40672426. ^ George Williams (2009). Shinto. Infobase Publishing. p. 151 note 13. ISBN 9781438106465. ^ Hoffman, Michael, "In the land of the kami, Japan Times, March 14, 2010. ^ Adler, Joseph. "Rudolf Otto's Concept of the "Numinous"". Kenyon College Department of Religion. Kenyon College. Retrieved 1 April 2017. ^ a b c d e f Amenominakanushi. Encyclopedia of Shinto. ^ Sugimoto, Yoshio (1997). An Introduction to Japanese Society. Cambridge, NY: Cambridge University Press. pp. 230–231. ISBN 978-0-521-41692-4. OCLC 35008178. ^ Kenney, Elizabeth (2000). "Shinto Funerals in the Edo Period". Japanese Journal of Religious Studies. 27 (3/4): 239–271. JSTOR 30233666. ^ "Shinto Funeral Beliefs and Rituals". ^ a b c d e f g h Handy Bilingual Reference For Kami and Jinja. Study Group of Shinto Culture. Tokyo: International Cultural Workshop Inc. 2006. pp. 39–41. ^ Ueoka, Ryoko; Kamiyama, Naoto (2015-08-02). Fortune Air: An Interactive Fortune Telling System Using Vortex Air Cannon. Human Interface and the Management of Information. Information and Knowledge in Context. Lecture Notes in Computer Science. Springer, Cham. pp. 646–656. doi:10.1007/978-3-319-20618-9_63. ISBN 9783319206172. ^ Kobayashi, Kazushige; Knecht, Peter, "On the Meaning of Masked Dances in Kagura", Asian Folklore Studies 40 (1): 1, 1981, p. 3. ^ Averbuch, Irit, The Gods Come Dancing: A Study of the Japanese Ritual Dance of Yamabushi Kagura, Ithaca, NY: East Asia Program, Cornell University, 1995, pp. 83–87. ^ Kobayashi, Kazushige; Knecht, Peter, "On the Meaning of Masked Dances in Kagura", Asian Folklore Studies 40 (1): 1, 1981, pp. 4–5. ^ Averbuch, Irit, The Gods Come Dancing: A Study of the Japanese Ritual Dance of Yamabushi Kagura, Ithaca, NY: East Asia Program, Cornell University, 1995, p. 12. ^ Averbuch, Irit, The Gods Come Dancing: A Study of the Japanese Ritual Dance of Yamabushi Kagura, Ithaca, NY: East Asia Program, Cornell University, 1995, p. 15. ^ a b c Averbuch, Irit, The Gods Come Dancing: A Study of the Japanese Ritual Dance of Yamabushi Kagura, Ithaca, NY: East Asia Program, Cornell University, 1995, p. 16. ^ Ellwood, Robert S. (1971). Bock, Felicia Gresset, ed. "A Translation of the Engi-Shiki". History of Religions. 10 (3): 267–270. JSTOR 1062014. ^ de Bary, Wm. Theodore; Keene, Donald; Tanabe, George; et al., eds. (2001). Sources of Japanese Tradition vol. 1, From Earliest Times to 1600 (2nd ed.). pp. 22–23. ISBN 978-0-231-12139-2. ^ Yusen, Kashiwahara (1994). The Shapers Of Japanese Buddhism (1st ed.). Tokyo, Japan: Kosei Publishing Co. pp. 3–13. ISBN 978-4-333-01630-3. ^ Josephson, Jason Ānanda (2012). The Invention of Religion in Japan. University of Chicago Press. p. 133. ISBN 0226412342. Averbuch, Irit (1995). The Gods Come Dancing: A Study of the Japanese Ritual Dance of Yamabushi Kagura. Ithaca, NY: East Asia Program, Cornell University. ISBN 978-1-885445-67-4. OCLC 34612865. Averbuch, Irit (1998). "Shamanic Dance in Japan: The Choreography of Possession in Kagura Performance". Asian Folklore Studies. 57 (2): 293–329. doi:10.2307/1178756. JSTOR 1178756. Blacker, Dr. Carmen (2003). "Shinto and the Sacred Dimension of Nature". Shinto.org. Archived from the original on 2007-12-22. Retrieved 2008-01-21. Bowker, John W (2002). The Cambridge Illustrated History of Religions. New York City: Cambridge University Press. ISBN 978-0-521-81037-1. OCLC 47297614. Breen, John; Teeuwen, Mark (2010). A New History of Shinto. Blackwell. ISBN 978-1405155168. Endress, Gerhild (1979). "On the Dramatic Tradition in Kagura: A Study of the Medieval Kehi Songs as Recorded in the Jotokubon". Asian Folklore Studies. 38 (1): 1–23. doi:10.2307/1177463. JSTOR 1177463. Engler, Steven; Grieve, Gregory P. (2005). Historicizing "Tradition" in the Study of Religion. Walter de Gruyter, Inc. pp. 92–108. ISBN 978-3110188752. Hardacare, Helen (December 1, 2016). Shinto: A History. Oxford University Press. ISBN 978-0190621711. Herbert, Jean (1967). Shinto The Fountainhead of Japan. New York: Stein and Day. Josephson, Jason Ānanda (2012). The Invention of Religion in Japan. Chicago: University of Chicago Press. ISBN 978-0226412344. OCLC 774867768. Kamata, Tōji (2017). Myth and Deity in Japan: The Interplay of Kami and Buddhas. Tokyo: Japan Publishing Industry Foundation for Culture. ISBN 978-4-916055-84-2. Kitagawa, Joseph Mitsuo (1987). On Understanding Japanese Religion. Princeton University Press. ISBN 978-0691102290. Kobayashi, Kazushige; Knecht, Peter (1981). "On the Meaning of Masked Dances in Kagura". Asian Folklore Studies. 40 (1): 1–22. doi:10.2307/1178138. JSTOR 1178138. Kuroda, Toshio, K.; James C. Dobbins; Gay, Suzanne (1981). "Shinto in the History of Japanese Religion". Journal of Japanese Studies. 7 (1): 1–21. doi:10.2307/132163. JSTOR 132163. Littleton, C. Scott (2002). Shinto: Origins, Rituals, Festivals, Spirits, Sacred Places. Oxford, NY: Oxford University Press. ISBN 978-0-19-521886-2. OCLC 49664424. Picken, Stuart D.B. (1994). Essentials of Shinto: An Analytical Guide to Principal Teachings. Greenwood. ISBN 978-0313264313. Picken, Stuart D. B. (2002). Historical Dictionary of Shinto. Lanham, MD; and London: The Scarecrow Press. ISBN 978-0-8108-4016-4. Williams, George; Bhar, Ann Marie B.; Marty, Martin E. (2004). Shinto (Religions of the World). Chelsea House. ISBN 978-0791080979. Yamakage, Motohisa (2007). The Essence of Shinto, Japan's Spiritual Heart. Tokyo; New York; London: Kodansha International. ISBN 978-4-7700-3044-3.